The most seen picture of last night’s Oscars was not neither taken by a DSLR, nor by a professional photographer and was not published (at first) in any publication. It was a selfie taken on a Samsung Note 3 by an actor and published on Twitter. If anyone needed a confirmation of where photography is heading, last night was a prime example. Relegated to taking full-length fashion shots behind barricades, or shooting the stage from a balcony, pro photographers were by far outclassed by attendees taking and publishing their own images using their cell phones. They could only watch as publications worldwide went to twitter to find and publish the best images. If it wasn’t for the glamour aspect of having rows of Tuxedo dressed photographers continuously flashing the red carpet as celebrities bathe in the sweet flow of mass admiration, it is probable that the Academy would dismissed them all and let the participants photograph the event. After all, they make no money from the pictures taken and it does cost a lot to organize their presence. This is probably the first year that a cell phone pic taken by a participant of the Oscars has more views than any of the professional images taken. However, it’s success certainly guarantees that we will certainly see more of it in the coming years, not just the Oscars but probably every other award ceremony. And after all, why not? No one has better access than the celebrities themselves and they certainly know everyone around them. But this is also a serious blow to any publication that rely on pro images to get their coverage. Cell phone photography escapes their control and end up being seen on social media long before they end on their website, making them obsolete and redundant. They are no longer the first and only place to see those images not seen on TV. 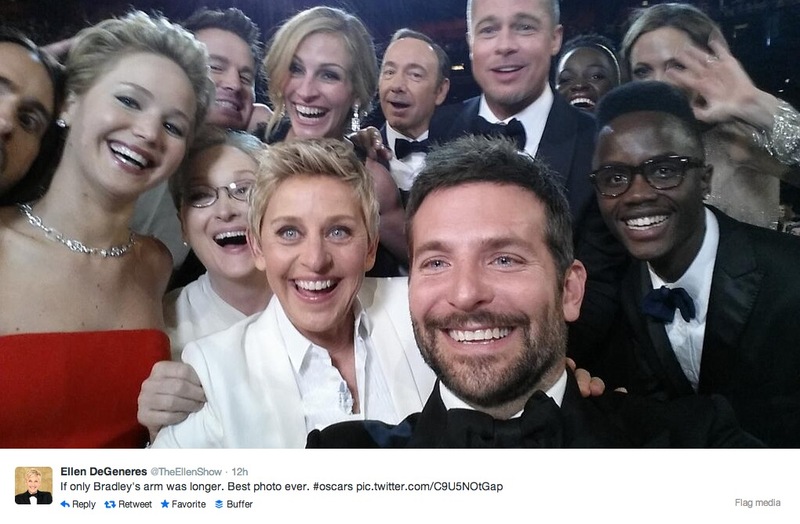 Last night most tweeted selfie was far more than a Guinness Book record. It was a huge cannon-shot in front of the bow of the already seriously crippled pro photographer/media relationship to its audience.